When you arrive at First Congregational Church, there are plenty of places for you to park. 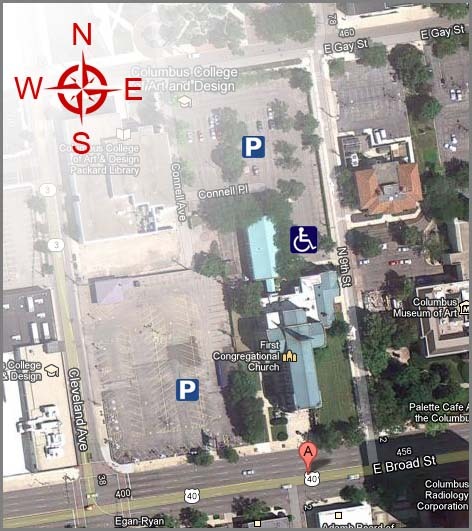 There is parking on the North Side of our building, with entrances to lots on Gay Street and 9th Street. Building entrances for these lots are at the North and East sides of the building, with handicap parking and an elevator entrance near 9th Street. There is also parking on the West Side of the building. Entrances to these lots are on Cleveland Avenue and Broad Street. Building entrances for this lot are on the West and South sides of the building. If you want to ride your bicycle, you can lock up your bike across Gay Street in front of Columbus College of Art and Design’s Schottenstein Hall (near the intersection of 9th Street and Gay Street). For those with special needs or disabilities please see our Accessibility page or the Church Office. Our 9 a.m. service is a casual gathering downstairs in our Parish Hall. We break bread together each week during this service, and all are welcome to the table. Members of the church who attend this service sign up for various duties, such as bringing snacks or reading scripture. When we pass the peace during this service, there is a table of beverage and snacks (this is a real hit with the kids). 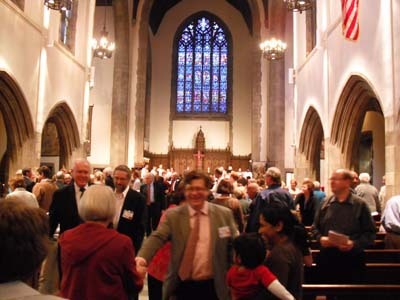 Our 11 a.m. service is in our beautiful Sanctuary. There are many opportunities to get involved. Children are invited to participate in Children’s Time during this service, as well as go to Worship Connections, in the Children’s Library, during the sermon. After worship, all are welcome and encouraged to enjoy coffee fellowship in Parish Hall. During both services we pass the offering plates. Loose offerings go to a charity which changes each Sunday, and is announced during the service. For monies going to other areas, please put your offering in an envelope (back of pews) with a note to where it should go. When inviting newcomers to our service we often hear, “What should I wear?” Our answer to this is simple – come as you are. We want you to be comfortable in this place of worship. You will see some members of the congregation wearing jeans while others wear a suit.